Here is a link to a sound file I (Pete) recorded while practicing today. It’s not super exciting and I’m still pretty bad, but I’ve read from several drummers that it’s a good idea to record and playback your practice sessions. This lets you hear where you need to work. I imagine it’s more useful when you don’t need to work a lot on everything. The description of what I’m doing (or trying to do) in the recording is for your benefit. I don’t normally talk to myself like that. I’ll also say that knowing I’m being recorded only adds to the suckiness. By Thursday, all should be a lot smoother. Anyway, this is where I am now. 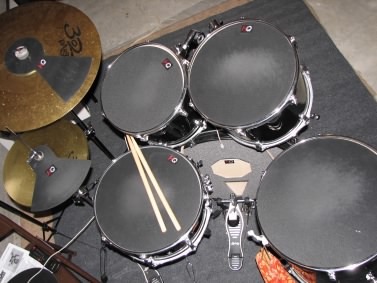 In a year, it should be a LOT better…Below is a picture of the drum kit. For the fills you hear, I travel from the snare drum (the one with the sticks) and then up in a clockwise route to the mounted toms above the base/kick drum and the floor tom. The high hats are the smaller of the 2 cymbal sets on the left. I don’t use the crash cymbal (the bigger one) in this practice. This entry was posted in General, Percussion on 8/6/2007 by P Schlax. Sounds like you are ready to go on tour to me. I am going to change the subject. Today on the golf course, we came up on three boys (9 -10 years old) that were fishing. One of the boys caught a bass that was about 14 inches long. I ask him what he was going to do with it and he said that he was going to release it back into the pond. I told him he could not put it back without giving it a kiss. Sure enough, he put the bass to his lips and gave it a kiss, then released it back into the pond. Another day in the life of a retiree.